The HVD20 through-hole high voltage divider resistor series from Ohmcraft® offers a voltage rating of 20kV, power rating of 2W, standard ratios of 1000:1 (A) or 100:1 (B) and a resistance range from 100kΩ up to 1TΩ all in a small radial leaded through-hole package. By utilising their patented Micropen® precision printing technology, they are able to provide a superior precision, thick-film through-hole resistor. HVD20 high voltage divider resistors offer very low noise, ultra-high stability with ratio tolerances down to ±0.1% (between 100kΩ and 100MΩ), absolute TCR as low as ±25 ppm/°C (between 1MΩ and 500MΩ) and VCR down to 0.05 ppm/V. The HVD series divider ratio is calculated using the formula Ratio = (R1+R2)/R2. Resistance in the part number is the total resistance i.e. R1 + R2. For custom configurations including sizes and ratios or other requirements, please contact us. Tolerance and value are case size dependent. Absolute tolerance is ±15% unless otherwise specified. TCR tracking is typically <25 ppm/°C. The HVD04 through-hole high voltage divider resistor series from Ohmcraft® offers a voltage rating of 4kV, power rating of 0.5W, standard ratios of 1000:1 (A) or 100:1 (B) and a resistance range from 100kΩ up to 1TΩ all in a small radial leaded through-hole package. By utilising their patented Micropen® precision printing technology, they are able to provide a superior precision, thick-film through-hole resistor. HVD04 high voltage divider resi.. 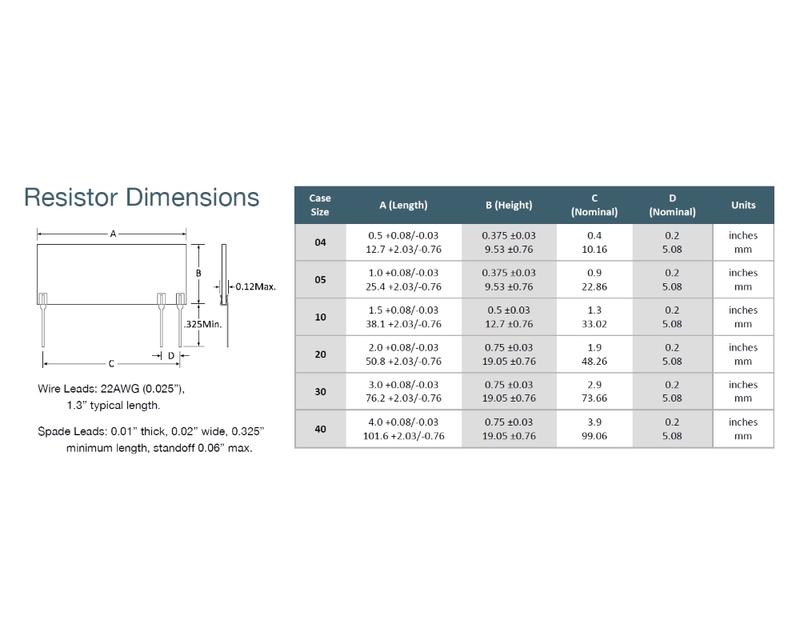 The HVD05 through-hole high voltage divider resistor series from Ohmcraft® offers a voltage rating of 5kV, power rating of 1W, standard ratios of 1000:1 (A) or 100:1 (B) and a resistance range from 100kΩ up to 1TΩ all in a small radial leaded through-hole package. By utilising their patented Micropen® precision printing technology, they are able to provide a superior precision, thick-film through-hole resistor. HVD05 high voltage divider resist.. 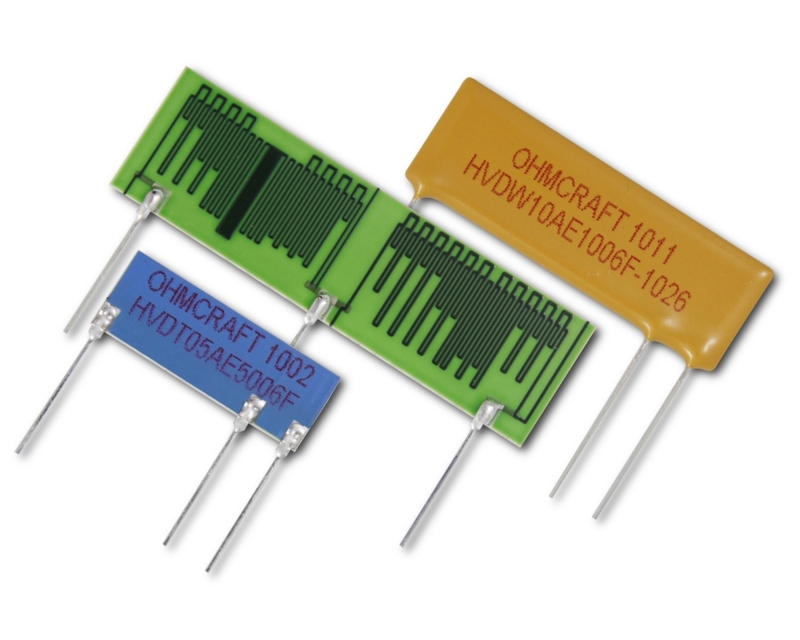 The HVD10 through-hole high voltage divider resistor series from Ohmcraft® offers a voltage rating of 10kV, power rating of 1W, standard ratios of 1000:1 (A) or 100:1 (B) and a resistance range from 100kΩ up to 1TΩ all in a small radial leaded through-hole package. By utilising their patented Micropen® precision printing technology, they are able to provide a superior precision, thick-film through-hole resistor. HVD10 high voltage divider resis.. The HVD30 through-hole high voltage divider resistor series from Ohmcraft® offers a voltage rating of 30kV, power rating of 3W, standard ratios of 1000:1 (A) or 100:1 (B) and a resistance range from 100kΩ up to 1TΩ all in a small radial leaded through-hole package. By utilising their patented Micropen® precision printing technology, they are able to provide a superior precision, thick-film through-hole resistor. HVD30 high voltage divider resis.. The HVD40 through-hole high voltage divider resistor series from Ohmcraft® offers a voltage rating of 40kV, power rating of 6W, standard ratios of 1000:1 (A) or 100:1 (B) and a resistance range from 100kΩ up to 1TΩ all in a small radial leaded through-hole package. By utilising their patented Micropen® precision printing technology, they are able to provide a superior precision, thick-film through-hole resistor. HVD40 high voltage divider resis..